What Is Apple’s TV App, and Should You Use it? 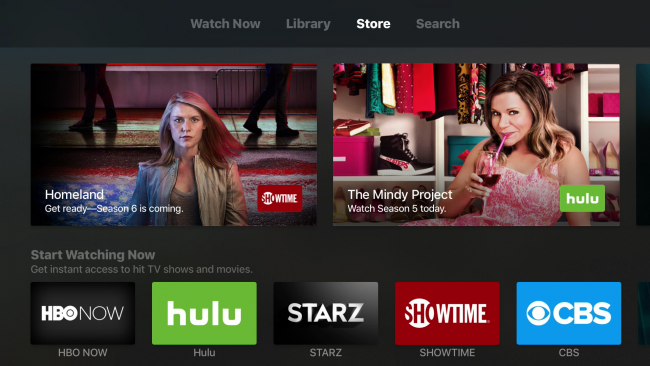 Apple’s TV app, which recently appeared on iOS devices and Apple TV, is meant to help users discover and watch shows across an increasingly expanding lineup of television channels, as well as iTunes movies and shows, in one central app. Apple continues to pursue its goal of being a television content provider, though that hasn’t quite gone according to plan. 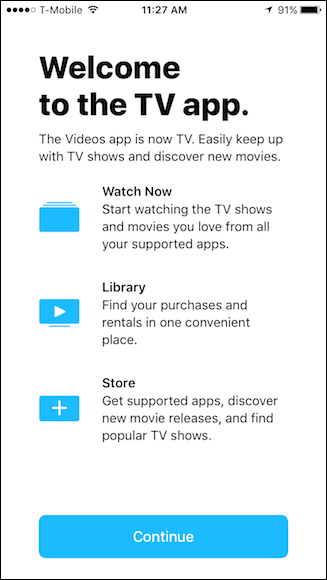 The TV app (formerly the Videos app) would appear to be an important tool towards achieving this goal, but does it actually have what it takes to make that happen? 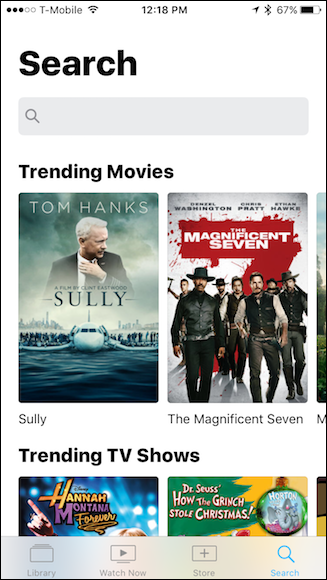 The TV app is virtually identical on iOS devices and Apple TV save its appearance, so we’re going to largely stick with screenshots from the iPhone throughout this article. If there are any differences between the two platforms, we’ll make note of them. 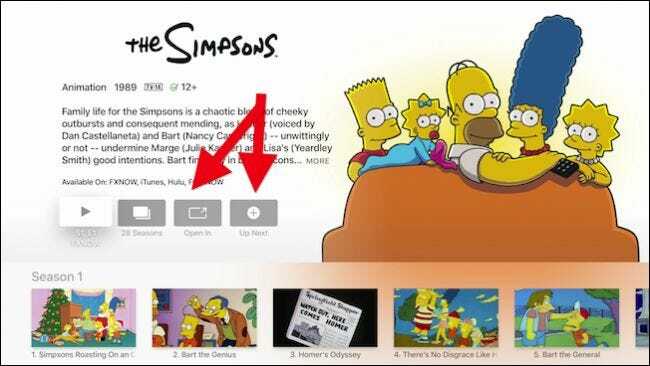 The TV app consists of three main components: Watch Now, Library, and Store, as well as an additional Search feature. The TV app on Apple TV: different platform, same result. 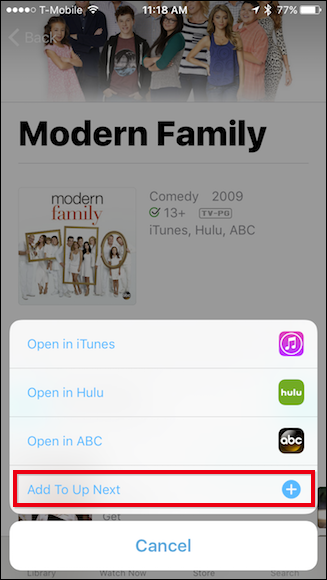 When you open the TV app on your iPhone or iPad, you’ll see your Library, which displays items that you’ve rented and purchased from iTunes. On the Apple TV, the default screen is the Watch Now feature, which seems intended as a sort of “TV Guide”, though it really doesn’t work that way. More on that in a minute. If you have other Macs or iOS devices with iTunes Home Sharing enabled, they will also appear on your Library screen (such as our MacBook Air in the screenshot below). 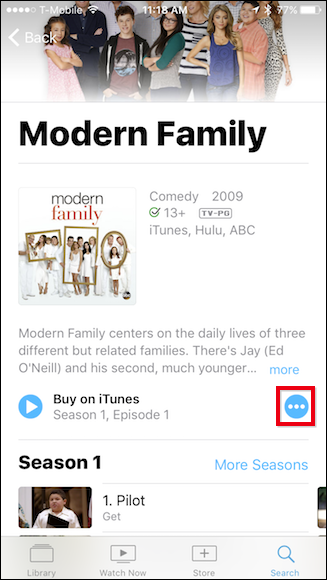 From there, you can access content you’ve added through iTunes on those devices. 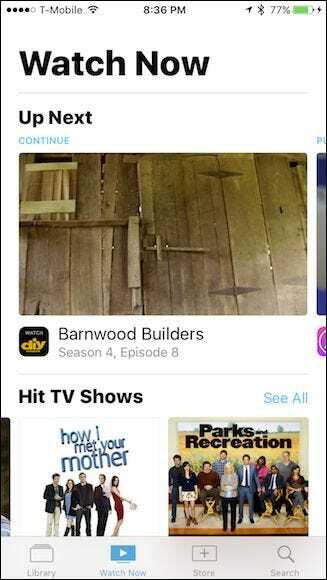 Tap on the Store tab, and you can download TV channel apps (like ABC or HBO Go) as well as buy content like movies and TV shows. 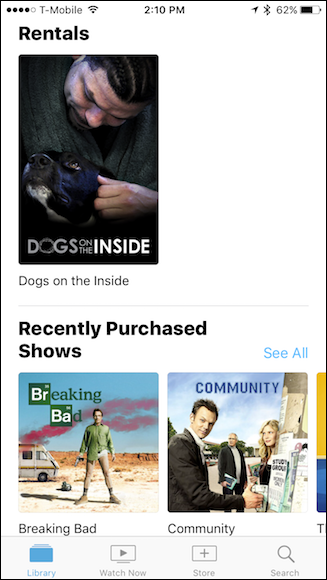 If you want to download a TV channel app, it will open the App Store on both iOS and Apple TV. 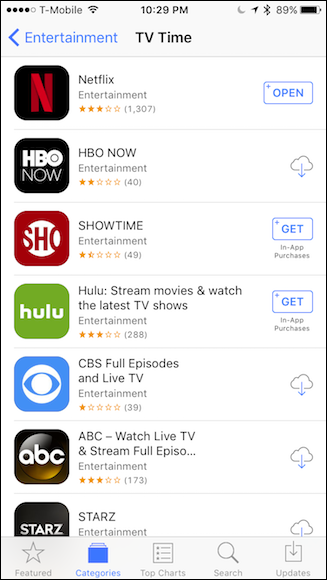 The TV app consolidates finding apps into one place, but this was never an issue, especially on Apple TV where the App Store makes quick work of this process. 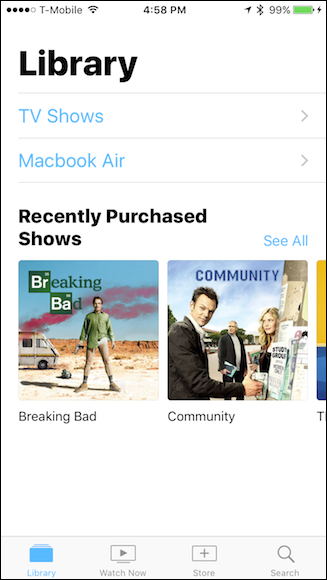 Buying or renting content is a little better, in that you don’t need to leave the TV app (left). 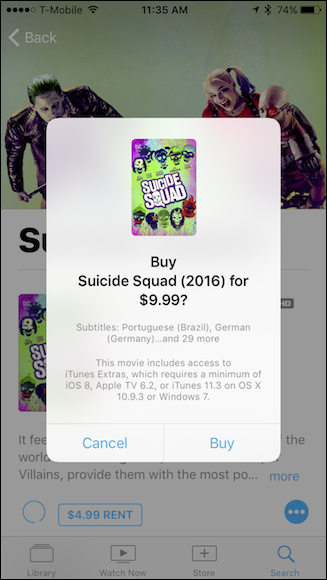 You can, however, also buy or rent movies and shows from the iTunes Store if you want (right). 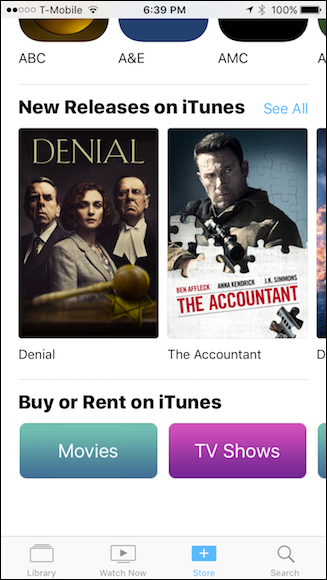 Finally, the last tab is for searching for content, especially iTunes’ library of movies and TV shows, which you can then buy or rent as shown above. 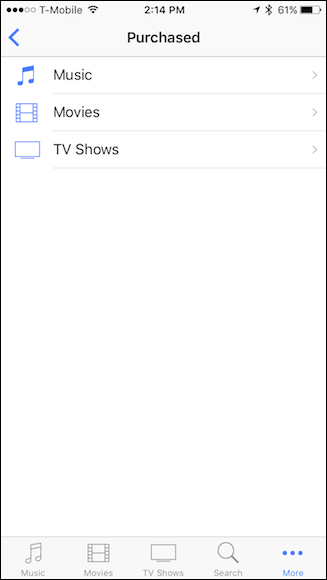 You can’t use the Search feature to find TV channel apps, but you can (though it isn’t at all obvious) find TV shows, which you can then use to see which apps you can view them in. If you don’t have the needed app, the App Store will open for you to download it. 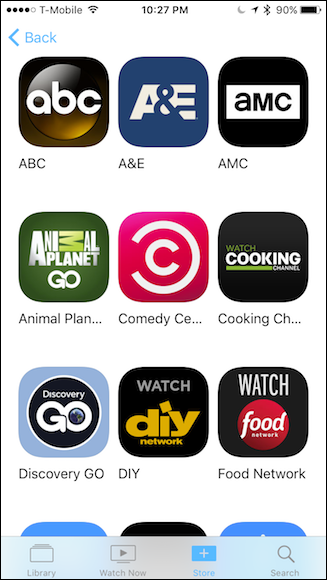 If you’re looking for a specific TV channel app, however, you will have to search for it using the App Store or perhaps happen upon it in the Store. As useful as the TV app could be, in its current form it’s somewhat reminiscent of the now-extinct Game Center app: it just doesn’t seem like Apple thought it all through completely. It feels unfinished and sparse, and most content providers are still doing their own thing. 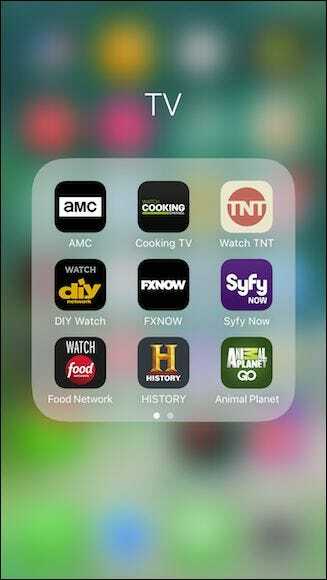 First, there are the TV channel apps, which should be an integral part of the TV experience. Because channel apps are separate and need to be downloaded from the App Store first, you end up with are a lot of individual apps taking up space on your iPhone or iPad. On the Apple TV, this is fine—these channel apps are one of its primary purpose, and they work pretty well. But on an iPhone or iPad, it’s clunky and cluttered. Worst of all, you can’t access all or even most of your downloaded apps from the TV app. Instead, you have to open the individual app from your home screen. Furthermore, channel apps that do work with the TV app aren’t exactly numerous (Netflix is notably absent), numbering among a handful out of all that are available. Then there’s the Watch Now feature. Using Watch Now is unsatisfying and doesn’t have a coherent feel to it. 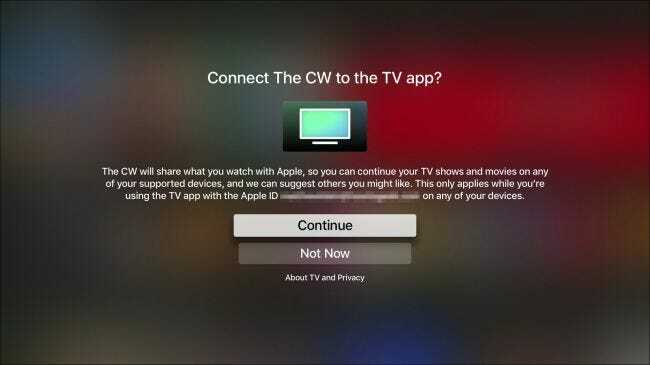 For example, if you want to connect a channel to TV, you first have to sign in with the channel, then quit the TV app and restart it. Only then will it (maybe) recognize the newly signed-in app and allow you to connect it to the TV app, but you won’t know until you actually download the channel app, sign in, and perform this ritual over and over, which gets old really quickly. As you can see in the screenshot on the left, only a handful of apps actually connect to TV (that’s 5 out 13 that we tested). Thankfully, it is a bit more streamlined on the Apple TV, which automatically asks you if you want to connect an app to TV when you first use it. As we mentioned, the Watch Now feature is meant to be something of a guide for your iOS device or Apple TV, but it really doesn’t work that way. A real TV guide will show you what’s on every channel. 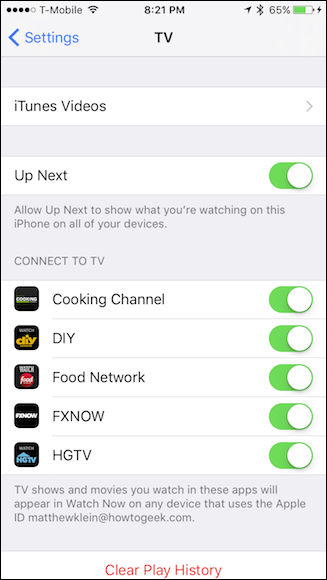 You should be able to tap on a channel, and then ideally, access channel content directly from the guide. 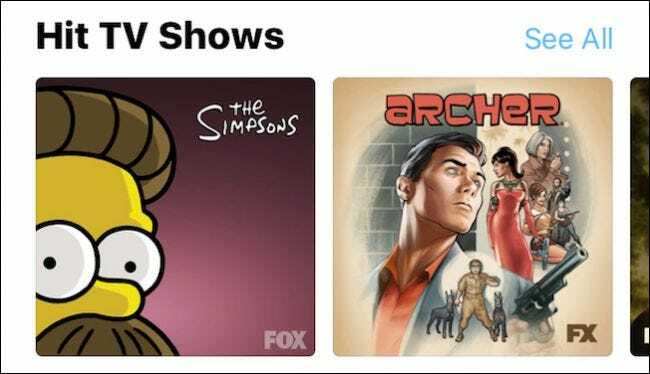 Out of all the content featured across our five apps that actually connect to Watch Now, we were only able to see a smattering of offerings. For instance, check out the screenshot below. This is what we’re shown when we tap “See All” Hit TV Shows. Seriously, that’s it: five shows. Keep in mind we’ve connected five channels to the TV app, on which there are dozens of programs. This will likely improve as more apps are connected to the TV app, but one has to believe that more would be represented here. 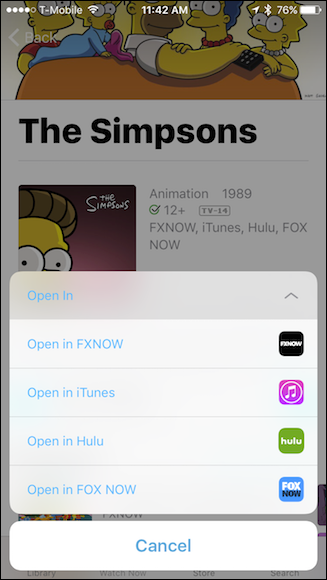 Thus, if you want to see everything that’s playing on Fox and FX, as well as HGTV, DiY Network, or Food Channel, you need to actually open up the relevant apps individually and look. Then, there’s the “Up Next” feature, which is just plain odd. First of all, Up Next lets you pick up where you left off. This means opening up a TV channel’s app, picking something out, and then stopping it. Only then will it appear under Up Next, which would be more accurate if it were named “Continue Watching” or something like that. Up Next does have some queue-like powers but you wouldn’t know it at first glance. In order to actually add items to Up Next, you first need to browse a title you’re interested in viewing, tap the blue dot as shown squared in red, and then tap “Add To Up Next”. Note also, this is also one way to open TV shows in their relevant TV channel apps. Incidentally, you can also perform this trick from the Search feature, though it’s no more intuitive. This could be a lot more obvious. You know how we know this? Because this is how it’s done on the Apple TV. It’s difficult to understand why the iOS version can’t have a simple set of obvious buttons similar to this. The whole Watch Now feature, and in particular Up Next, needs some serious work on iOS, and while it’s quite a bit more intuitive on the Apple TV, it still falters due to that one crucial area: lack of app support. While the TV app definitely needs more compatible apps, and the Watch Now feature could use some serious work, it’s not all bad. The Library does function as intended—a place to quickly access content you’ve already purchased or rented from iTunes. In fact, it’s a lot more slick than using the iTunes Store to see your purchased content. 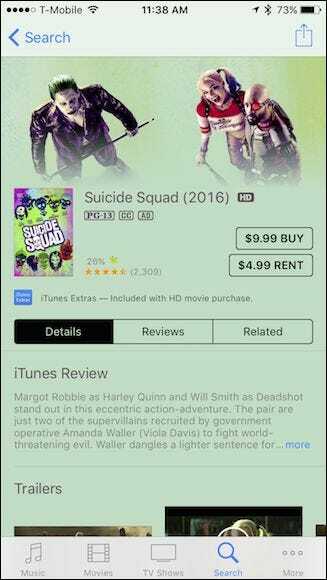 Additionally, the Store works well for easily for buying and renting movies and TV shows, though the iTunes Store does seem more extensive and well designed. 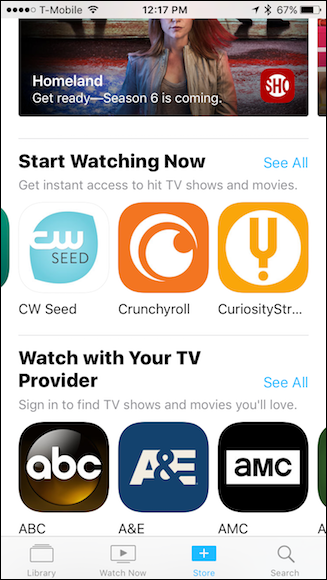 You can also see a list of TV channel apps available, but it makes more sense to just use the App Store, which has a better selection and allows you to directly download them from it. So, there is some promise here, but right now using the TV app to view content really doesn’t make a whole lot of sense. Why use it when only a few channels are actually supported and you have to open most apps from your home screen anyway? Furthermore, the few apps that actually work with TV aren’t fully fleshed out, nor can you see all of a channel’s offerings. 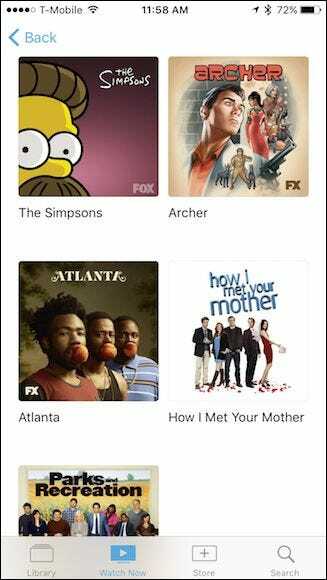 Truthfully there’s nothing the TV app does on either iOS or Apple TV that you can’t accomplish with the App Store or iTunes Store. But why, then, do we need another app that doesn’t adequately bridge the gap between these apps or offer a suitable replacement to them? 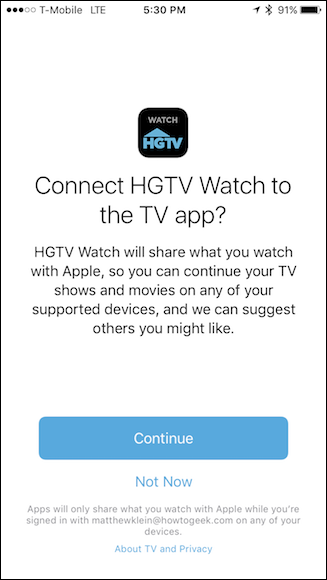 Apple clearly has their work cut out for them—clunky implementation, limited app support, and a kind-of third-wheel feeling—it’s going to be some time before the TV app’s existence is justified. As things stand right now, however, Apple seems to have missed a golden opportunity to get things perfect right from the start, and what we’re left with is basically another app that most users will probably delete and forget about.